If you will live like no one else, later you can "live" like no one else. Build up your money muscles with Americas favorite finance coach. Okay, folks, do you want to turn those fat and flabby expenses into a well-toned budget? Do you want to transform your sad and skinny little bank account into a bulked-up cash machine? Then get with the program, people. 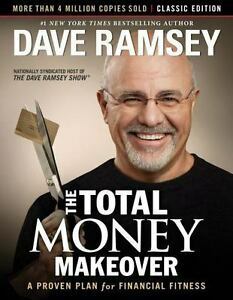 Theres one sure way to whip your finances into shape, and thats with "The Total Money Makeover: Classic Edition." By now, youve heard all the nutty get-rich-quick schemes, the fiscal diet fads that leave you with a lot of kooky ideas but not a penny in your pocket. Hey, if youre tired of the lies and sick of the false promises, take a look at this--its the simplest, most straightforward game plan for completely making over your money habits. And its based on results, not pie-in-the-sky fantasies. With "The Total Money Makeover: Classic Edition, "youll be able to: Design a sure-fire plan for paying off all debt--meaning cars, houses, everything Recognize the 10 most dangerous money myths (these will kill you) Secure a big, fat nest egg for emergencies and retirement If you will live like no one else, later you can live like no one else. Build up your money muscles with America's favorite finance coach. Okay, folks, do you want to turn those fat and flabby expenses into a well-toned budget? Do you want to transform your sad and skinny little bank account into a bulked-up cash machine? Then get with the program, people. There's one sure way to whip your finances into shape, and that's with The Total Money Makeover: Classic Edition. By now, you've heard all the nutty get-rich-quick schemes, the fiscal diet fads that leave you with a lot of kooky ideas but not a penny in your pocket. Hey, if you're tired of the lies and sick of the false promises, take a look at this--it's the simplest, most straightforward game plan for completely making over your money habits. And it's based on results, not pie-in-the-sky fantasies. With The Total Money Makeover: Classic Edition, you'll be able to: Design a sure-fire plan for paying off all debt--meaning cars, houses, everything Recognize the 10 most dangerous money myths (these will kill you) Secure a big, fat nest egg for emergencies and retirement Includes new, expanded "Dave Rants" sidebars tackle marriage conflict, college debt, and more. All-new forms and back-of-the-book resources to make Total Money Makeover a reality. If you will live like no one else, later you can live like no one else. Build up your money muscles with AmericaÆs favorite finance coach. Okay, folks, do you want to turn those fat and flabby expenses into a well-toned budget? Do you want to transform your sad and skinny little bank account into a bulked-up cash machine? Then get with the program, people. ThereÆs one sure way to whip your finances into shape, and thatÆs with The Total Money Makeover: Classic Edition. By now, youÆve heard all the nutty get-rich-quick schemes, the fiscal diet fads that leave you with a lot of kooky ideas but not a penny in your pocket. Hey, if youÆre tired of the lies and sick of the false promises, take a look at thisùitÆs the simplest, most straightforward game plan for completely making over your money habits. And itÆs based on results, not pie-in-the-sky fantasies. With The Total Money Makeover: Classic Edition, youÆll be able to: Design a sure-fire plan for paying off all debtùmeaning cars, houses, everything Recognize the 10 most dangerous money myths (these will kill you) Secure a big, fat nest egg for emergencies and retirement!